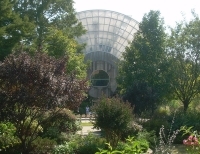 The Myriad Botanical Gardens are a 17-acre floral paradise right in the centre of downtown Oklahoma City. In addition to flourishing plant life, rolling hills, walkways, sculptures, and a sunken lake, the gardens feature the seven-storey, circular Crystal Bridge Tropical Conservatory. The conservatory is an architectural wonder, home to exotic flora as well as lizards, parrots, butterflies, and fish. Visitors take paths that lead under the conservatory's 35-foot (11m) waterfall and enjoy picnics on the grassy lawns. Opening times: Crystal Bridge Tropical Conservatory: Monday to Saturday 9am-5pm, Sunday 11pm-5pm. Park grounds daily 6am-11pm. Admission: Crystal Bridge Tropical Conservatory: $8 adults; $5 children 4-12. Other concessions available. Park entry is free.